Welcome to the Course, Making Your Art Pop in Photoshop! If you have trouble pushing the level of your digital art and find yourself having issues breaking into that “Cover Art” level, this class is for you. In this course we will be developing a good process and technique to bring your art Pop and your digital paintings more Pull and Depth. I will teach you how tackle your paint application, as well as how to think about color. As well, we will go over Color & Depth, where I will show you step-by-step how I take a painting that is stuck in the dreaded “middle-zone”, where it just doesn’t look right and is boring to look at, and bring it up to the next level. Finally, we will go over the importance of taking everything we’ve learned up until this point, and applying it to a full digital painting using a reference so we can focus on really getting down what we’ve learned. I hope you enjoy the course! Who is this class for: Below is a skill chart of where you should be before taking this course. If you are closer to the intermediate side, you may do fine in skipping the Digi-Basics videos and start right from the “Imaginative Sketch Painting” video and go on from there. If you feel you are not at that level yet, or are not sure, I encourage you to watch from the beginning. Regardless of the skill chart below, almost anyone can take this course with Photoshop, but you need to know at least the basics of your digital art program and how to get around it. 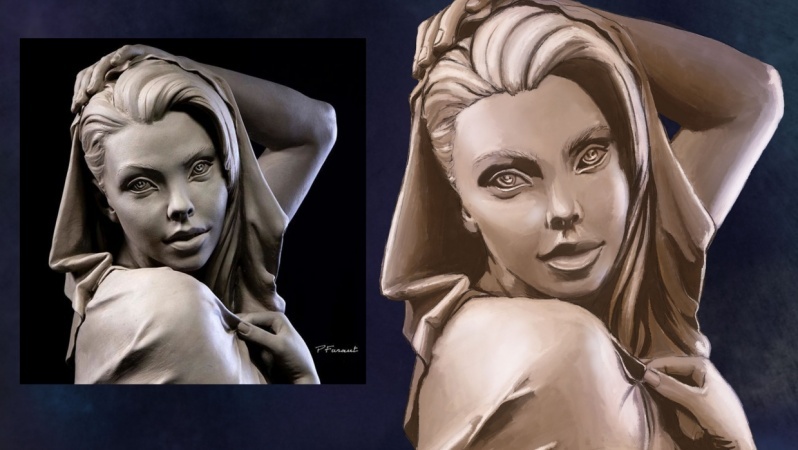 Advanced Artists can also gain from this course with the Tips & Tricks in it. NOTE: Please see the Brief and Assignment PDF for more information about your Exercise and Assignment. I am a professional freelance illustrator, painter, and just a general lover of telling a story through art. I started learning art with a professional intention in 2012 and have not looked back, studying under artists such as Patrick J. Jones, Leandro Ng, Christopher Canga, Joe Weatherly, Thomas Marsh, Daniel Cooney, and other great artists. I currently work freelance, with experience in Card Art to web design, and also delve into traditional painting.